The post below was written and submitted by Mike, a customer of Off the Vine Market. Enjoy and be inspired! Thanks, Mike, for sharing this great story with us! In her book, Barbara Kingsolver describes her success at making mozzarella. Her narrative was so inspiring: we could just see it sitting there amongst some fresh slices of tomato and green basil leaves, with just a hint of olive oil and balsamic vinegar. She made the process sound easy, and dare I say, foolproof. Upon returning home from Atlanta I immediately ordered a cheese making kit. As we waited anxiously for its arrival we planned all of the various ways we would be serving our homemade fromage. We also got copy of Kingsolver’s book and studied the cheese making chapter like it was a treasure map. The key seemed to be in choosing the right milk. Finding one that was not ultra pasteurized would be the determining factor between ending up with a nice globe of mozzarella or something that resembled cottage cheese. We chose a store bought variety of organic whole milk that seemed to fit the bill. When the kit arrived we wasted no time heading into the kitchen, brand new stainless steel pot ready to go. As the Italian member of the family it was decided that I would take charge of the process and Kathy would routinely refer to the instruction book to keep me on course. As I stirred the milk to its desired temperature all I could think was, “Barbara was right, this is easy.” This thought stayed with me as we moved onto the next phase of adding the rennet, putting a lid on the pot, moving it off the heat and letting the magic of the separation of curds and whey take place. All still seemed well as I carefully cut through the curd and began to slowly stir it over the heat once again. Hopes were still high as I poured the whey off and ladled the curd into a bowl where the final stage was to take place. 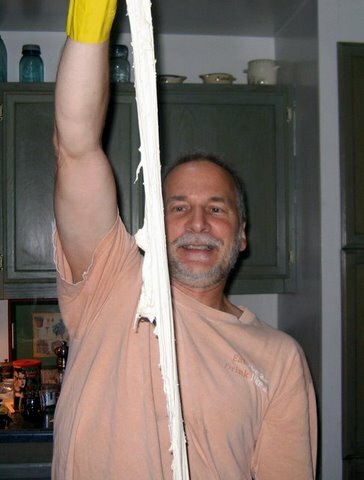 As I grabbed the warm mass of soon-to-be mozzarella, I followed the instructions to “stretch it like taffy.” The problem was that it would not stretch and with each movement the once solid form was beginning to crumble. With only a mild degree of panic I consulted the instruction book which assured me that I only had to reheat it and it would gracefully do my bidding. I place the mass back into the strainer and placed it over the heated water in the pan. Within seconds, the mass began to dissolve back into a milky liquid before my very eyes. There would be no caprese salad in our immediate future. Undaunted, Kathy and I tried a second time. We chose another brand of store bought non-ultra pasteurized milk and headed back into the kitchen. Kathy came up with the idea that before embarking on this second venture we should call on the spirits of her famous cheese making ancestors from Bern, Switzerland, for their assistance. So, even before pouring the milk into the pot, we both asked that their spirits guide us toward success (we really wanted to be eating our own mozzarella that night). The second try went along pretty much like the first but this time there was no meltdown at the final step. 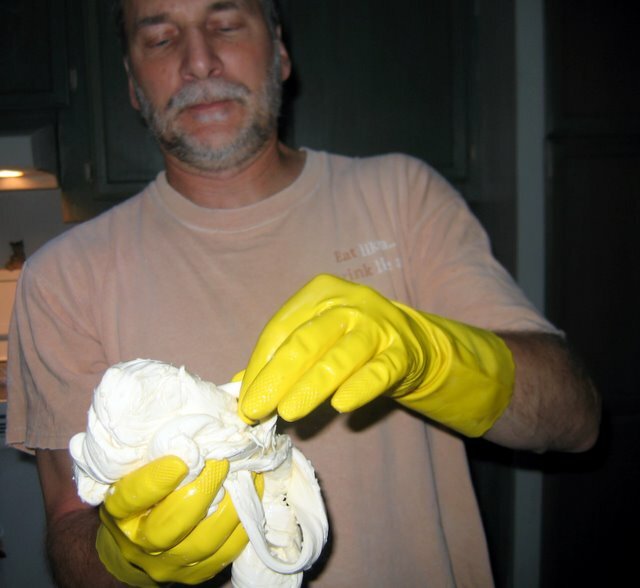 As I stood there over the sink, I began the slow process of pulling at curds. To my dismay, there was no taffy-like quality. I ended up with two chunks of warm curd in my hands that would not stretch no matter how many times I tried. There would be no pepperoni pizza tonight. I put the mass of not mozzarella into a container. The container went directly into the refrigerator, mostly because neither of us could stand to look at it anymore. It turned into a ricotta-like substance which was actually very tasty. If the third time was going to be a charm, something needed to change. We were suspect of the milk we had used. Fortunately, as a result of reading the Kingsolver book, Kathy and I were burgeoning enthusiasts of the local food movement. We had recently discovered the Off the Vine website. Tess at Off the Vine assured us that Trickling Springs Creamery was the answer to our cheese prayers. Fresh natural milk in hand, we headed back into the kitchen. Before long, however, Kathy decided that she could not stay and watch another attempt. As I stood over the pot, I would occasionally shout out the current state of affairs to Kathy who had adopted a supportive yet, “I can’t stand to watch,” role. Finally the moment came for the all-important stretching. I pulled and the curd separated in my hand. Convinced that we had the right milk this time, I took its temperature. It was at the 135 mark so it was time to pull. A taffy like substance began to grow between my hands. At this moment Kathy returned to the kitchen, saw the elastic band of milky magic and immediately ran for the camera. The cheese cooled and held it shape! I held it up like the catch of the day as Kathy snapped a series of pictures. Finally there was mozzarella in the house, and its wonderful, buttery, fresh taste made it worth all of the effort!! !